GREAT 2 STORY HOME. 5 BEDROOMS. ONE ON FIRST FLOOR COULD BE HOME OFFICE. 3 FULL BATHS. MASTER ON 2ND FLOOR. LOTS OF SIMULATED WOOD TILE. SEE CC&Rs. WITH FULL PRICE OFFER SELLER OFFERING $3000 ALLOWANCE FOR INSTALLATION OF GRANITE COUNTER TOPS IN KITCHEN TO BE PAID TO CONTRACTOR UPON COMPLETION OF INSTALLATION. CENTRAL LOCATION. CLOSE TO HWY 70 & LOHMAN. 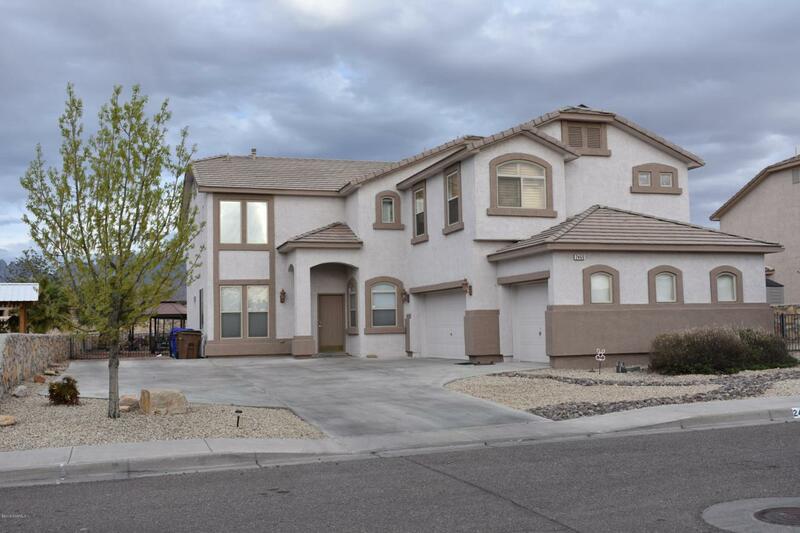 EASY ACCESS TO NMSU,, MOUNTAIN VIEW HOSPITAL AND TELSHOR BLVD. GREAT VIEW OF THE ORGAN MOUNTAINS. LARGE BACK YARD WITH GAZEBO, GRASS, & VIEW OF THE ORGANS. 5 YEAR OLD SOLAR SYSTEM, WITH SOLAR CREDIT TRANSFERABLE (INFO IN DOCUMENT FILE). RV PARKING .